One of Net Entertainment’s most beloved games, Mega Fortune is as true to its name as pokies come. 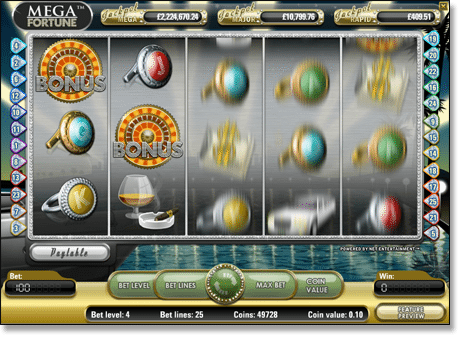 Released in 2009, this game has paid out more than any other online pokies game, with jackpots that include AUD $25.6m, setting a world record for the largest ever online progressive jackpot. This prize was so insanely huge the winner even made it to the Guinness Book of Records. Unfortunately, as of 2016, Mega Fortune is no longer available to Aussie players. The whole game is dipped in the life of luxury, with the visual theme of money giving players a taste of the possibilities that this game can bring. 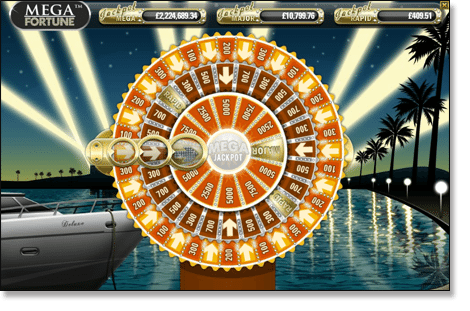 Mega Fortune uses glitzy, slick graphics consisting of all the high rolling icons; yachts, champagne, limousines, cigars and fancy bling, which not only looks ultra-impressive, but will make you hungry for that big score. Mega Fortune is no longer available for Aussie players, but you can play other NetEnt progressive jackpot pokies for real money in Australian dollars at one of our favourite online gambling platforms, G’Day Casino. G’Day offers reliable, secure payment methods like bank deposits, Visa, MasterCard and Netteller among a range of others, and give players plenty of incentives to sign up for an account. 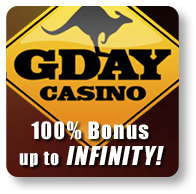 G’Day not only offer new users a welcome bonus where they will double the size of your first deposit (no matter the amount), but also 50 free spins on selected pokies game. Take advantage of these sweet deals and give Mega Fortune pokies a crack to see what all the fuss is about. Mega Fortune uses a simple yet classic display that is utterly steeped in glamour and extravagance. It’s an easy game to understand, played over five reels and 25 pay lines and allows for a vast range of betting options. Scatter Symbol = the scatter symbol is the champagne icon. Landing three or more scatters anywhere across the reels will kick off the Free Spins feature. The scatter can then be activated again during Free Spins, with two or more resulting in a possible 5 x multiplier, allowing for some big bucks to be won here. Wild Symbol = the wild symbol is the speedboat and landing five or more of these bad boys will result in a 10,000 coin jackpot. The wild will also substitute for all other symbols excluding the scatter and the wheel bonus. Bonus Symbol = the bonus symbol is the ‘bonus wheel’ and an appearance of three or more of these from left to right over any active pay line triggers off the chance to play for the Mega Jackpot (and we mean mega – how does millions of dollars sound?). The bonus symbol is the one you really want to cross your fingers for. The Rapid Jackpot – projected winnings of AUD $500+. To win the rapid jackpot players must hit one of two ‘rapid’ symbols in the second section of the bonus wheel. The Major Jackpot – projected winnings of AUD $50,000+. To win the major jackpot players must land on the ‘major’ symbol in the final section of the bonus wheel. The Mega Jackpot – projected winnings of around AUD $4,000,000. Yes, you read that correctly – four million big ones! Taking home this extraordinary jackpot is no easy task; players need to land on an arrow in each section of the bonus wheel in order to hit the Mega Jackpot symbol in the centre. Not an easy feat, but still, four million dollars… Is your mouth watering yet? Mega Fortune is visually sleek and elegant, with a nice, crisp format that makes for riveting game play, but above all else (let’s be honest) it’s the chance for the big wins that really makes this game so phenomenal. While players may come for the graphics, they will stay for the jackpots. The possibility of scoring some major cash is just too tempting and that’s what we really love about Mega Fortune. The game is also playable on all smartphone and tablet devices – tap the G’day app image from your mobile or tab to load the mobile interface. Net Entertainment really produced a beauty here, with an online pokies that’s been a fan favourite for years now, and shows no sign of disappearing any time soon. This game really puts to rest any doubts by sceptics that there’s no real money to be won in online pokies. Mega Fortune has the potential to change lives and if luck isn’t on your side, well, it sure is a fun and striking game to play anyway.